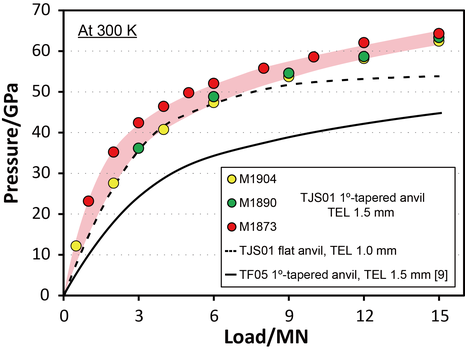 We have expanded the pressure ranges at room and high temperatures generated in a Kawai-type multi-anvil apparatus using tungsten carbide anvils. At room temperature, a pressure of 64 GPa was achieved, which is 20 GPa higher than that achieved by Ishii et al. . 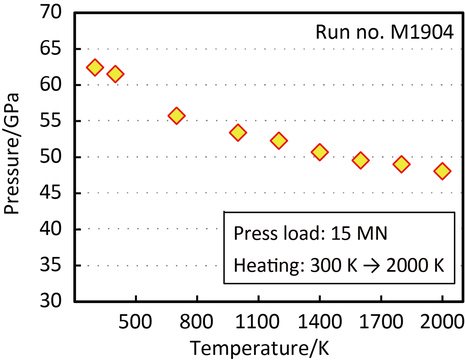 Pressures of 48-50 GPa were generated at high temperatures of 1600 to 2000 K.
Pressure generation during heating up to 2000 K at a constant press load of 15 MN.